Antiseptic, warming and soothing. Certified by ECOCERT, this organic Clove Bud essential oil produced on the tropical island of Madagascar has a wonderfully full-bodied, warm and spicy fragrance. Clove bud oil has almost unrivalled antimicrobial, antiviral, and antifungal properties which are invaluable against a wide range of pathogens. Amazingly, a 1% concentration of clove bud oil has an antiseptic strength 3-4 times more powerful than phenol. Clove Bud oil imparts a strengthening and energizing effect ideal for beating the blues or shaking off lethargic and melancholic states, and is one of the best analgesic essential oils available in aromatherapy. Use it in massage to relieve all manner of general aches and pains after a strenuous day, and its carminative action eases digestive upsets, especially when blended with ginger or black pepper essential oils. Although the essential oil obtained from clove leaves and clove stems are cheaper, they are not suitable for aromatherapy because not only are they are severe skin irritants, but they do not contain the same range of therapeutic properties as Clove Bud essential oil. 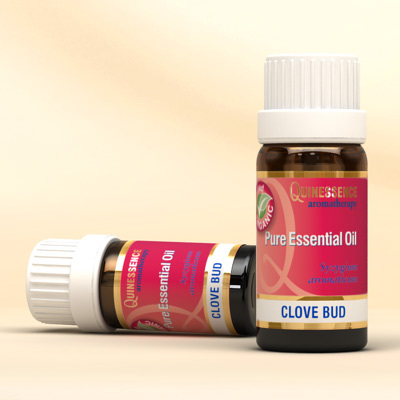 When buying clove bud oil, check it is clearly labelled as 'Clove Bud' and not just 'Clove' or you can be sure it will be either oil from the leaf or stem, or even a blend of both.